Earlier this week I had the opportunity to get to know our new ASPECT President, Valerie Meaney, a little better and I can happily report that ASPECT's leadership is in good hands. Val (at left in photo) joined me in Victoria for a meeting at the Ministry of Social Development and Poverty Reduction where we heard their plans for engaging contractors delivering the new WorkBC program. Val shined as someone who is knowledgeable, approachable, and able to discuss the details -- with statistics -- associated with going through the procurement process, startup, and a deep understanding of the delivery of the program. Although the meeting turned out to be more informative than collaborative, we both appreciated the opportunity to be invited to meet. Valerie Meaney is Executive Director of North Islands Endowment Foundations Society (NIEFS) in Campbell River with offices in Port Hardy and a satellite in Port McNeil. She has a vast experience in the sector and an east coast sense of humour. 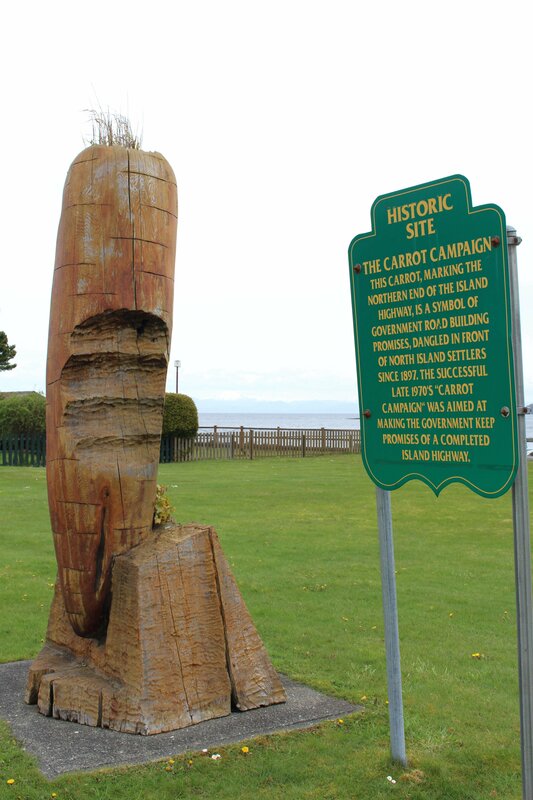 She told us a story of a visit of ministry staff to Port Hardy, where Val encouraged the tour to include a visit to Carrot Park (see photo below). With humourand a dose of reality, she was able to clearly demonstrate the frustration experienced by those in rural and remote areas to have their voices heard by government. I have never seen the wooden carrot in real life, but I certainly have the lesson of Val's funny story to remind me to keep my understanding broad when I advocate on behalf of ASPECT members. If I'm sounding a little like a fan-girl, you can bet I was impressed with Val during my day with her and to John Dawson who was on the board of directors for eight years and lead ASPECT as President for three years, you can rest assured that the association is in good hands.